I just started raising rabbits 8 months ago. I have meat rabbits and Mini Rex. I spend an hour every morning and evening with my guys, plus check 2 to 3 times a day. Yesterday at feeding I found one of my 8 week old meat babies not at the hutch door ready for food as usual, but in the corner. When she tried to move she just fell over on her right side kicking her back legs. She was fine that morning, and the day before she was first at the door for food. No sign of illness at all. I took her from the cage immediately, I could find no sign of trauma, no injury at all. Yet she was listless. And when she did move it was like watching a seizure happen. Her head bent back, front feet straight out, back feet angled straight back, and stiff as a board. This was heart breaking!! After 20 minutes she cried out 2 times then died! What is going on? One of her siblings did the same thing at 4 weeks. They are on good feed, fresh grass (pesticide free) 3 times a week. I clean the feed bowls every 2 days, more if they are dirty. Can Anyone give me a clue? I am at a loss, and I do not want to lose any more of my babies this way! It was horrible!!! So sorry to hear it. The problem is clearly infectious, as a sibling died with the same symptoms 4 weeks earlier. It is very important that you get a correct diagnosis for the causative agent. We have a couple ideas and we'll share them with you, but your best bet is to have a necropsy done by a vet, or a nearby university ag program might also be able to help. The symptoms are the result of an inflammation/infection in the brain. A likely suspect is the protozoan parasite known as Encephalitozoon cuniculi. The symptoms depend on the part of the rabbit that is infected. Learn more at https://www.raising-rabbits.com/rabbit-illnesses.html. There is also the chance that a case of wry neck caused by Pasteurellosis has advanced directly into the brain from the inner ear. We're not sure however that this would offer the same constellation of symptoms that E. cuniculi is known to produce, and that you've described. If your rabbits are generally healthy otherwise and you haven't had any outbreaks of sneezing or white snot, there would be no real reason to suspect pasteurellosis. Comments for Rabbits with Seizures? I am not sure if this would be a solution to anyone, but I had a similar experience with 4 baby bunnies. I had to painfully watch 3 of them die in what looked like a really painful way. What saved the 4th was careful watching over his diet. Their mom had died so we had to feed them diluted cows milk and this was the start of the problem. Two days later the convulsions started, and they started dying one after the other. I read up a bit more, determined to save the last one, and I notice that the babies never pooped or peed after their feeding which is a big red flag. I immediately switched the milk to a much more diluted baby formula instead of cows milk and also started giving him digestive medicine called "digetone" (you need to be careful with how much, I gave mine 2 drops after his feeding) and that was it. He pooped and peed like a normal baby rabbit and he never went through what his siblings had to. I know cows milk is a big no no but in India where I was living at the time you don't get medicine catered to sensitive care of a rabbit let alone alternative milk. I hope this helps or gives some kind of insight. I know there are different kind of reasons to the seizures, but hopefully this could help. Have a bunny farm and have lost 560 bunnies. Done all I could; it stresses me out. They healthy and suddenly have a fit kicking with back legs and front legs and die on the spot, adults, small ones alike. What could be the problem? They are in small wire cages, water and pellets and grass. Thank you. Yikes, first, I hope '560' is a typo, and second, there is no doubt a contagious problem running rampant. I hope you have quick access to veterinary care. My rabbits have been doing the same thing. I've gone out to the pasture where we keep our 100+ bunnies and have found sometimes 10 dead. When I went in to check on them it was laying on its side unable to move so I grabbed it and held it while it was about to die hoping to save it and it kept having seizures till it had died in my hands. I think it might be malnutrition but I'm not completely sure. Hey Anon, so many questions here, not the least of which is: "Did you just say that you have 100+ rabbits all running free in a pasture?" Or are they in cages in a barn? At any rate, re-read the main post on which you've commented, as all of the possible causes apply in your case, and even more so if your rabbits are running loose. Ten dead does not necessarily equate to malnutrition, unless they are also emaciated. It is more likely a sign of a parasite or other disease process. If they are all exposed one to another, this pathogen will get passed around amongst the rabbits. If you do not get this figured out, hopefully through a veterinarian, your 100 rabbits may soon number 10... or less. Good luck with everything. I have been looking all over the internet for the answer to the same symptoms that 4 of my current litters have had. I raise Silver Foxes and have lost at least 3 - 5 kits from each litter due to the exact same symptoms as described by Janet. All of these kits range from 3 - 10 weeks of age. I do admit that I have fed grass clippings that were raked, dried and stored like hay. There are no vets in my area who are savvy with rabbit issues. This has never happened before and it's bothered me so much that I'm thinking about getting out of rabbits completely. If it is the E. Cuniculi, will my adult rabbits be affected as well and die? If it is E. cuniculi, the youngsters are getting the parasite from adult carriers of the infection, rabbits that will stay healthy unless their immune systems get weak or fail, say, from old age. Since the parasites are transmitted in the urine, it becomes very important to keep the cages very clean. A rabbit with a strong immune system may be able to overcome the infection and not remain a carrier. Have you seen any trends with the deaths? For example, are all the deaths in the litters of the same one or two rabbits? If you can figure out which of your rabbits carry the parasite (enlist a vet's help if needed), you may be able to cull the sick animals and continue your breeding with healthy animals. Could it be the problems are a blessing in disguise? 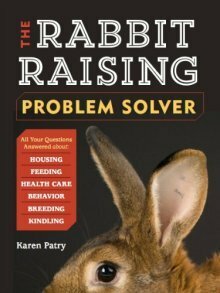 Identify and solve the problem, and your rabbits will be better and better. The next time a kit dies, do a necropsy or pay to have one done. Take a look at its kidneys. E. cuniculi pits the surface of the kidneys and otherwise damages them. I'm hoping you can get to the bottom of the symptoms! Good luck. There - now I'm truly out of bright ideas. I hope you can solve the problem. Good luck.